Thursday night, a show of artwork from the art collection of Stephanie Smither and the late John Smither called As Essential as Dreams opened at the Menil. 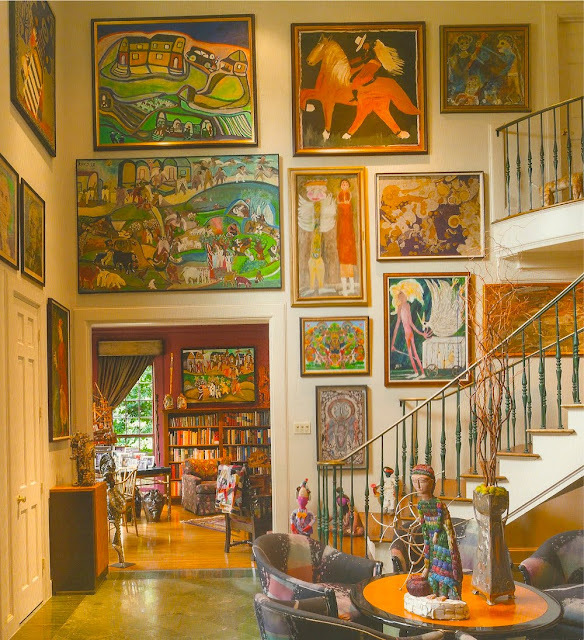 This is the second time in two years that works from this amazing collection have been on display (the last time was in 2014 at the Art League in a great show called One of a Kind: Artwork from the Collection of Stephanie Smither, which I reviewed). The show opened on the same day as the announcement of a huge gift to the new Menil Drawing Institute, currently under construction on West Main Street between Loretto and Yupon Streets. The gifts were from Louisa Sarofim and former Hosuton gallerist Janie C. Lee; they include works on paper by Jasper Johns, Jackson Pollock, Agnes Martin, Ellsworth Kelly, Cezanne, Willem de Kooning, Brice Marden, Eva Hesse, Robert Rauschenberg, Georgia O'Keefe, Mark Rothko, Richard Serra, Barnett Newman and others--a total of 100 drawings by 41 artists. As I looked at the art on display, I noticed the labels all identified the art as "promised gifts to the Menil Museum." So on the day they announced the Sarofim and Lee gifts, the Smither gift was effectively also announce. And the Menil will be perfect home for her collection. The Menil has already shown a willingness to collect visionary or outsider art work (see for example their holdings of Charles A.A. Dellschau, Henry Darger, Bill Traylor, etc., much of which was displayed in the excellent exhibit Seeing Stars: Visionary Drawings from the Collection). And with the new Drawing Institute, there is a renewed commitment to works on paper and the conservation challenges they pose (Martín Ramírez drawings must be a special challenge for conservators). I think it is great that the Menil is going deep into this kind of art with the Smither gift. Just three days later, Stephanie Smither died. She had serious health problems and had had both lungs transplanted. The timing is poignant but at least she got the opportunity to see her collection in its new home.